Capgemini's Sudhir Pai, left, and Swinburne's Aleksandar Subic. Swinburne University of Technology has launched a global blockchain Centre of Excellence in partnership with Capgemini, a technology services and digital transformation business. The centre will focus on advancing blockchain technologies, platforms, assets and systems to develop industry understanding and implementation of blockchain technologies. Blockchain technology uses the power of a distributed ledger to allow data and transactions to be verified accurately and efficiently. Swinburne’s multi-disciplinary team will collaborate with Capgemini’s network of global experts to lead development and implementation of innovative blockchain solutions from proof of concept to production. Based at Swinburne’s Hawthorn campus in Melbourne, the Centre of Excellence operations will be managed by Capgemini chief technology officer for financial services, Sudhir Pai, and Swinburne dean of the digital research and innovation capability platform, Yang Xiang. The centre will provide research-led thought leadership and drive strategic blockchain developments to address complex business problems in financial services, creative industries, manufacturing, food, pharmaceutical and health domains. Swinburne deputy vice-chancellor (research and development) Aleksandar Subic said blockchain is at the heart of the fourth industrial revolution and digital economy. “We see this technology as the key digital innovation platform supporting global supply chains, intellectual property and trade across a range of industry sectors in the future. “The partnership with Capgemini will consolidate our complementary capabilities and networks within the scope of an interdisciplinary global Centre of Excellence. “The centre is focused on translational research and development of innovative solutions to complex systems problems in industry that require active collaboration between many stakeholders and sectors, which is why this unique public – private sector partnership is essential,” said Subic. “What makes Blockchains so powerful is the fact that they are distributed and digital, but this in turn creates significant challenges relating to connectivity, performance, interoperability, validation and security, which the centre aims to address. “Successful development of blockchain solutions will depend not only on our technology but also on how well we work with our global industry partners on the development of new business strategies and capabilities,” said Subic. Capgemini’s Sudhir Pai, said the partnership will allow for more exciting blockchain use cases across industries. “Applying blockchain to enterprises is a game changer for many industries. 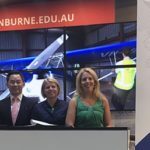 Our collaboration with Swinburne will provide a platform for industry collaboration with academic institutions and start-up communities to support innovation and growth in today’s digital economy,” said Pai.